It’s a sign of spring in Northern Berkshire. 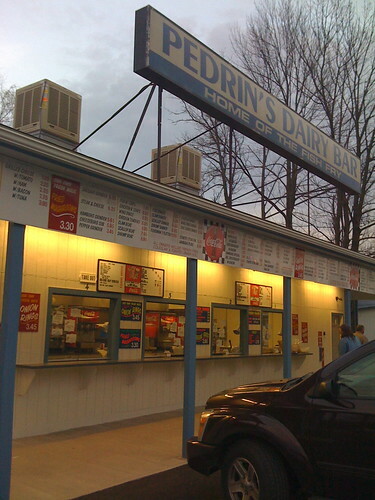 Word gets around that Pedrin’s is open for the season, and cars line up along route 8, though in April it’s generally too cold to sit at one of the painted picnic tables; instead everyone carries their food back to their cars and eats sheltered from the wind, listening to the Red Sox Radio Network on some AM station I can’t name. Although Pedrin’s recently re-opened with an expanded menu (they do offer a garden salad now; they’ve added sweet potato fries to the slate alongside regular fries, onion rings, battered mushrooms, and of course fried zucchini in season) this is not a health food joint. You go to Pedrin’s for the fried foods and for the fish. You can get whole fried clams, or belly strips, as a dinner or on a roll with tartar sauce or cocktail sauce; and you can get fried fish, again as a sandwich or as a “meal” (with fries and homemade cole slaw.) Everything is made to order, so there’s usually a bit of a wait; take your token and mill around until they call your number. There are burgers on the menu, but I can’t imagine why you would order one. (Burgers in the Berks agrees; for my money, if you want a great burger, go to the Old Forge in Lanesboro. More on that in a future blog post, maybe.) The Forge does a good fish & chips; so does the Freightyard in North Adams. But for the classic fish fry experience, Pedrin’s is top of the line. Rumor has it they changed their fish this year — from cod to haddock, or the other way around, I can’t recall. Whatever they’re serving, we had some on Saturday night, and it was fantastic: succulent and flavorful, the batter adhering to each slab of fish as though it was meant to be there. I’m glad that spring has come to the Berkshires at last.